☆YOGA STRAP-----Yoga strap and belts made of non-elastic and high quality nylon, super strong stitching, 2 extra loops (12 all together), optimal size 96\" x 1.5\". Besides using for yoga, stretching, ballet ... is recommended by physiotherapists as effective aid for rehabilitation. 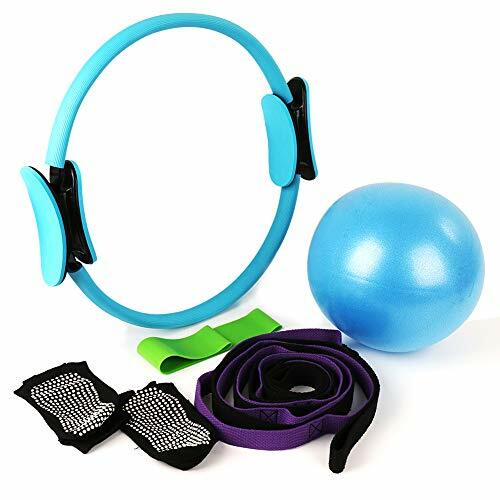 ☆Exercise bands-----Resistance loop bands-made of 100% odor-free natural latex, flexible and durable premium quality assured,which you can easily take fitness bands to the office, gym or travel. Perfect gift choice for friends and family, build healthy and fitness lifestyle together. YOGA SOCKS------One Size Fits Most (Women\'s shoe 6-10 / Men\'s shoe 5-10)★ Allowing you to freely spread your toes, the socks aid in relieving the pain and discomfort generated by wearing closed shoes every day. These socks are designed to support the natural flexing and movement of your feet. Moreover they aid in giving you more balance. ☆YOGA RING-----The Pilates circle is ideal for floor and Pilates exercises, can be used to burn belly fat and tone upper arms, inner & outer thighs, Abs & pelvic muscles - enhances mobility, agility & stamina.Compact & lightweight design with best toning ring featuring padding inside and outside of the ring brings you a safe and comfortable exercise. The foam of ring won\'t totally come out because the foam is soft.